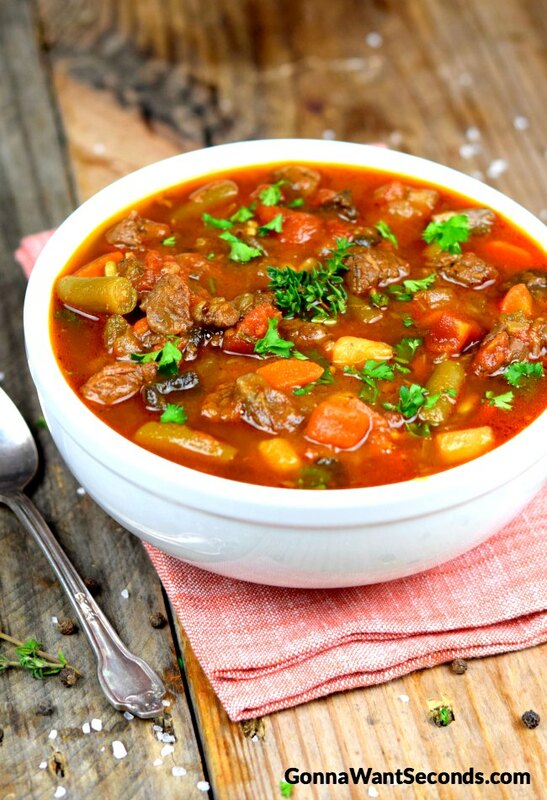 This Hearty, Old Fashioned Vegetable Beef Soup has an incredibly rich broth and is loaded with tender chunks of beef and all the right veggies! Is there anything as classic, as heartwarmingly nostalgic, as Vegetable Beef Soup? It’s got to be right up there with chocolate chip cookies and apple pie in the list of “things that make us think of childhood.” Every winter I sift through my soup recipes and pick a few that I can make in big batches and freeze, to make sure I’ve got family-sized meals ready to go anytime. It’s one of my favorite winter traditions—and my family’s too. 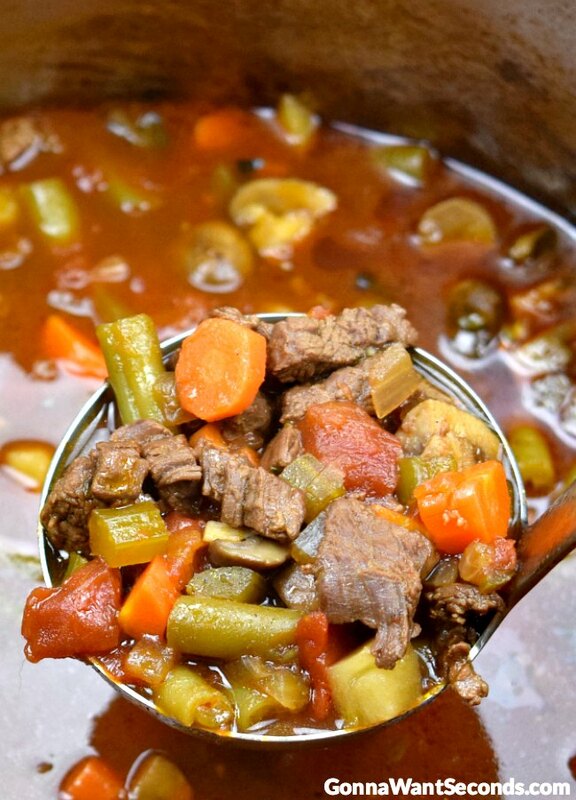 This recipe for easy vegetable beef soup is about as perfect for that tradition as it gets my friends. It’s hearty, filling, yummy, and freezes darn well. My family loves to pull this soup out of the freezer on a cold winter day and let the flavorful broth, beef, and veggies warm up our bones. This soup is also great to serve with small gatherings—like book clubs or lunch meetings. I hope you give it a try and let me know what you think! I like to use flank steak when I make this recipe. It is full of flavor and cooks up nice and tender—perfect for soup—in a reasonable amount of time. While beef chuck does certainly seem like a likely choice for vegetable beef soup, I think that chuck just takes too darn long to cook properly. The chuck needs a long, slow cooking time to get tender, and so it doesn’t work as well in this recipe. I have also found that the flank steak is much leaner, making it the healthier choice for this soup. If you happen to have ground beef around, and if you want to use that for a version of this recipe… go for it! 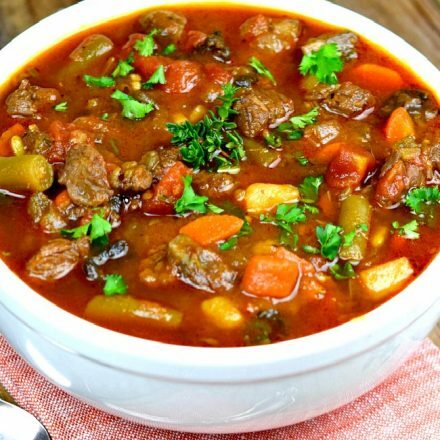 Follow the recipe instructions, but go ahead and substitute two pounds of ground beef for the cubed flank steak to make a delicious and simple Group Beef Vegetable Soup. Remember that the flank steak is leaner, so you’ll have some extra fat if you use the ground beef. I suggest you drain off the fat, then proceed with the recipe. To Your SOUP OR DINNER Board For Later. 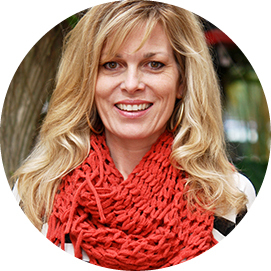 I’d Love To Be Friends On Pinterest! 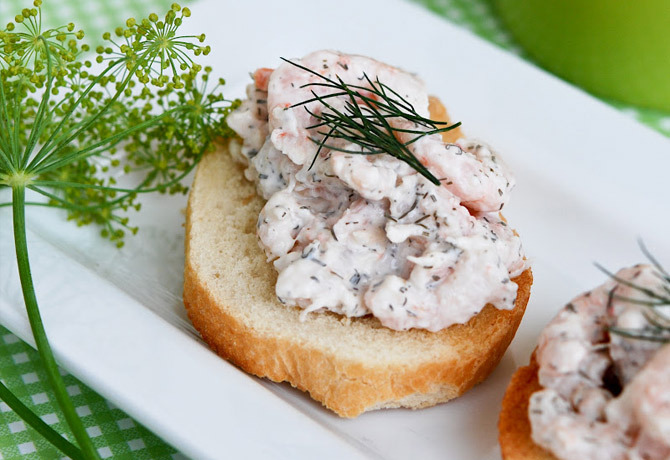 I’m Always Pinning Tasty Recipe! 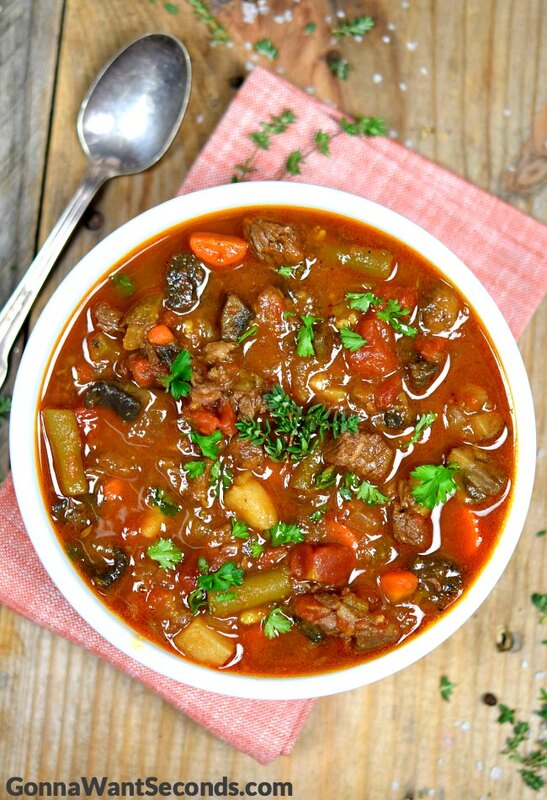 Can Vegetable Beef Soup Be Made Ahead? Yes! This soup tastes even better (is that possible?) if you make it a day or two ahead of serving. All those wonderful flavors marry and mix, the broth part of the soup thickening and tasting even richer. This soup also freezes pretty well, so make a big batch and save some for later! 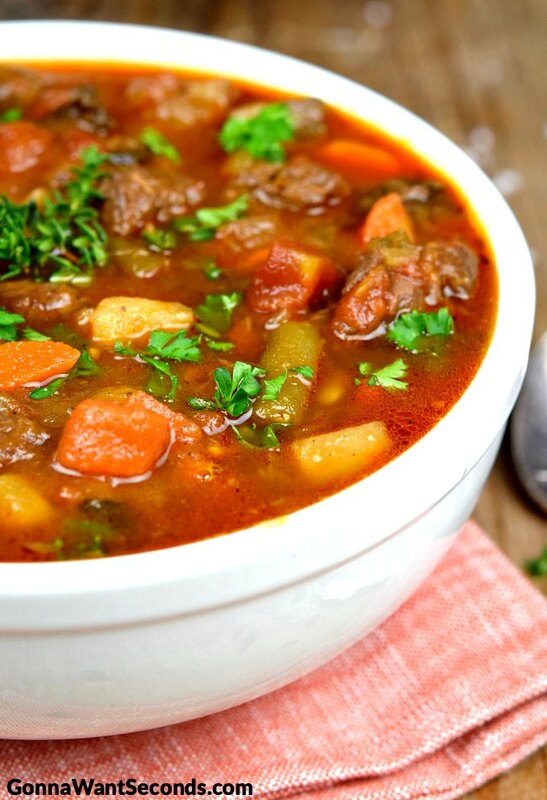 This Hearty, Old Fashioned Vegetable Beef Soup has an incredibly rich broth and is loaded with tender chunks of beef, and all the right veggies! In a medium mixing bowl, combine the beef and soy sauce; set aside and marinade 15 minutes. In a large Dutch oven, heat 1-2 tablespoons vegetable oil, over medium heat until it's begins to shimmer. Add the mushrooms and saute, stirring frequently until the mushrooms are soft. Remove to a bowl and set aside. In the same pan, add 1-2 tablespoon of oil and the onions and brown, stirring frequently until the onions are browning and dark pieces are forming on the bottom of the pan, about 8-12 minutes. Remove the cooked onions to the bowl of mushrooms and set aside. Add 1-2 Tablespoons of oil to the pan, then add half the beef. Cook, stirring occasionally until liquid evaporates and the beef begins to brown, about 6-10 minutes. Remove to a plate and brown the remaining meat the same way. Return the first batch of browned meat back to the pan with the second batch. Add 1 teaspoon salt, 1 teaspoon pepper, tomato paste, and garlic and cook stirring constantly, about 30seconds. Add the red wine, maintaining the heat and stir vigorously with a wooden spoon to loosen up the brown bits. Continue to cook until the liquid becomes syrupy, about 1-2 minutes. Add the rest of the ingredients along with the cooked mushroom/onion mixture and bring to a boil. Reduce heat and cook on low, covered, until the vegetables and meat are tender 40-50 minutes. 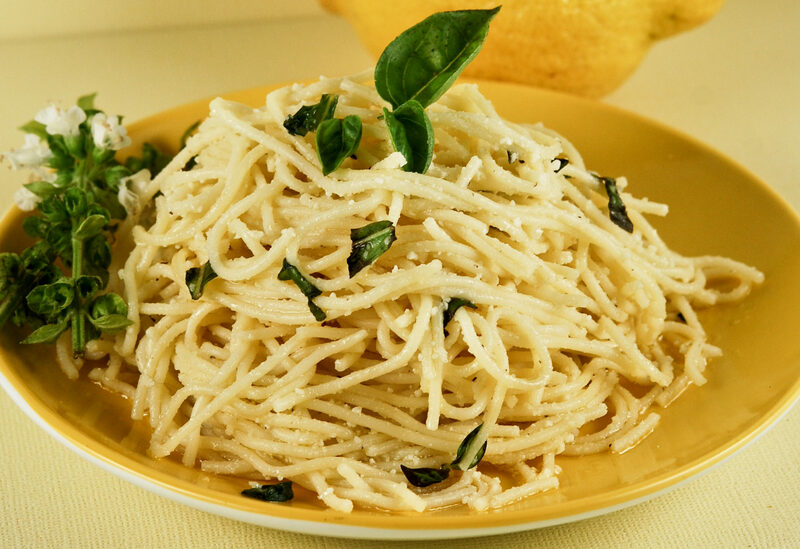 Remove bay leaf and adjust seasoning and serve. Potatoes: Believe it or not, the type of potato you choose to use in this recipe is a rather big deal. Deciding which potato to use can be a little complicated, so you need to determine what characteristics you want in your potato before embarking on your journey to find the perfect one. I have a love affair with Russet potatoes. I’ll admit it. They’re my “go to” potato for a whole bunch of different recipes—and I absolutely love them in this soup. As they cook in the broth, they soften—as you can imagine. And their edges begin to crumble ever so slightly. This adds a little extra starchiness to the broth, thickening it and making it heartier. I think those soft, tender bites of carby goodness are wonderful in this soup. If you like the broth of the soup even thicker, try shredding one or two extra Russet potatoes into the soup. They will dissolve into the soup, filling it out and making it thicker and heartier. Also, if you let the soup sit in the fridge overnight, that will help the soup to thicken a little bit. Other types of potatoes work well in this soup recipe too. It just depends on what your preference is. Yukon Gold potatoes have a delicious, buttery flavor and they hold their shape well through the cooking process. Red potatoes hold up, like the Yukon Gold, staying firmer than Russet potatoes. Cook’s Illustrated prefers red potatoes for their potato soup, insisting that they create a “more potato-flavored” soup. 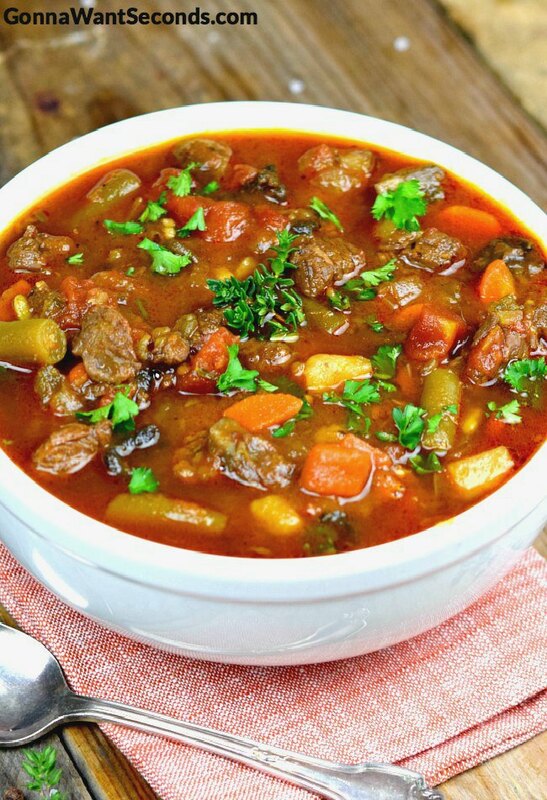 My dad absolutely LOVES this old-fashioned vegetable beef soup recipe. He insists that the potatoes in the recipe get cubed very small—that’s the way he likes them! Often when you order a beef vegetable soup at a restaurant, you’ll find that potatoes are cut into gigantic chunks—way too big. My dad says nothing ruins soup like getting a huge hunk of potato on your spoon and none of the other goodies. I absolutely agree with him on this point. When I dig into a bowlful of hot, hearty soup, I want to get a mix of things on my spoon. All this to say that I usually cut my potatoes fairly small—no bigger than 1/2 inch cubes. That’s what works for me. But if you’re a potato lover, you might want chunks a little bigger than that. Aromatics:As with most soup recipes, you can’t forget to sauté the aromatic vegetables before adding them to the soup when you make up this recipe. When the vegetables in this soup are raw, they contain compounds that are pungent and sulfurous—not what you want in your soup. But when those same vegetables are heated, the compounds actually change in flavor profile, becoming less harsh and less intense… actually evolving into something sweet and, in my ever so humble opinion, wonderful. Yes, the mushrooms and onions need to be cooked in two separate batches. Why? You ask. Well, simply because if you try to brown them at the same time, the pan will be overcrowded and the veggies will steam rather than brown. You will not create any fond if you steam your veggies. For this soup recipe, in particular, it’s important to brown the onions until they are well browned—look for small dark bits (dark brown not black) forming on the bottom of the pan. Those bits are what the French call fond, and they help to create a deep, fantastic flavor in your finished soup. That depth of flavor is intensified when the beef is browned in the same skillet. That creates another layer of fond which is added to the soup when the pan is deglazed. Of course, the choice of liquid to use in your deglazing will impact the final flavor as well. I use red wine because it compliments and pairs with the browned beef perfectly. I love my nonstick pans just as much as the next person—but here’s a little secret: when I’m browning something and intending to deglaze the pan I never use a nonstick pan. Those little brown bits that I work so hard to achieve do not seem to be created with a nonstick pan. So I go ahead and use a regular large pot with this soup. And don’t worry about clean up—you won’t have to angrily scrub at the pan bottom to get the stuff off. When you deglaze the pan all that stuff you would have to scrub gets easily lifted up and used to create flavor in the soup. It’s a perfect solution: less cleanup and more flavor! 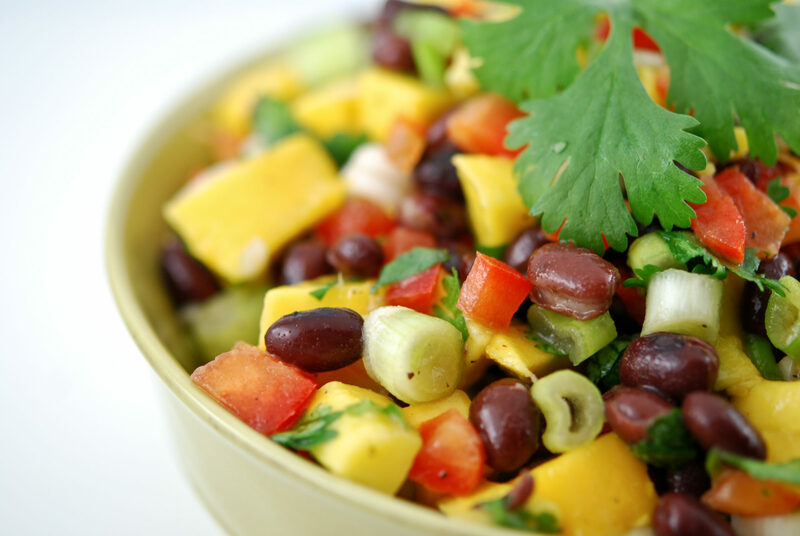 Vegetables: This recipe is super versatile when it comes to veggies. You can change or adapt the veggies listed to anything you like or prefer. Go ahead, make that Vegetable Beef Soup With Cabbage, or that Vegetable Beef Barley Soup. Whatever you want! I’ve listed my preferences in this soup, but you can experiment and design your own. Some people like peas or corn in their soup. Some folks like green beans, some don’t. Some people want extra potatoes, while some are going low carb and skipping the potatoes altogether. Beef Broth and Soy Sauce:This recipe calls for low sodium beef broth and soy sauce. The amount of salt called for in the ingredients list is used to make up for the low sodium broth and soy sauce. So if you end up using products that aren’t low sodium, make sure you reduce the amount of salt you use. Better than Bouillion: “Better than Bouillion – Beef Flavor” is an awesome product. I love it and use it often in my cooking. It does so much work to add a ton of rich, meaty flavor to broth without adding a whole bunch of extra salt. I typically use the regular version of this product, not the low sodium version. Even Cook’s Illustrated recommends this product. They taste-tested the top ten selling national supermarket plan beef broths, and “Better than Bouillion” was their number one choice! That’s one heck of a recommendation! Variation: I know a few people who really love a good beef noodle soup recipe. This regular vegetable beef recipe is a good base for a noodle recipe. Just add as many dried egg noodles as you’d like (I typically use about 1–1 1/2 cups) to the soup pot with the rest of the soup ingredients. If the soup gets too thick, thin it with extra beef broth or water. Brown the mushrooms in a skillet until they’re soft. Use a slotted spoon and transfer them right over to the slow cooker. Brown the onions in the same skillet, stirring frequently until the onions are browning and dark pieces are forming on the bottom of the pan, about 8-12 minutes. Use a slotted spoon and transfer them to the slow cooker. Brown all of your marinated steak in a skillet. I do it in two batches, so the skillet doesn’t get overcrowded, and the steak browns properly. Use a slotted spoon and transfer the browned steak to the slow cooker. Add tomato paste and garlic and to skillet and cook stirring constantly about 30 seconds. Add the red wine, maintaining the heat and stir vigorously with a wooden spoon to loosen up the brown bits. Continue to cook until the liquid becomes syrupy, about 1-2 minutes. 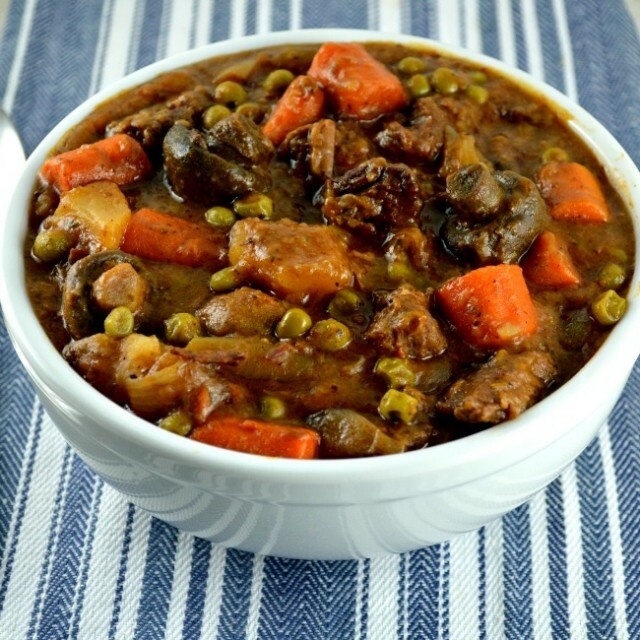 Pour into slow cooker. Add 1 teaspoon salt, 1 teaspoon pepper, beef broth, Better than Bouillon, Worcestershire sauce, thyme, bay leaves, canned tomatoes with their juice, potatoes, carrots, celery, and thawed and drained green beans. Cook soup for 3-4 hours with your crockpot on “high.” Or, on low for 6-8 hours. Looking For More Delicious Soup Recipes……..
Cheeseburger Soup – Loaded with chunks of meat, veggies, and cheesy broth! Easy Cream of Broccoli Soup – This soup is loaded with flavor and nutrition benefits! Chicken Tortellini Soup –One dish dinner loaded with juicy chunks of chicken, tender tortellini, veggies and a bit of sausage. Easy Potato Soup – Comfort food, warm, quick, and easy to make! Lasagne Soup – Rich tomato based soup loaded with Italian sausage, pasta, mushroom, and spinach! Italian Sausage Soup – Savory sausage, pasta and more merge to create one of the best Italian Sausage Soup recipes around. A taste of Florence without leaving your kitchen! 15 Bean Soup – Grandma’s Easy Old Fashioned Recipe for 15 Bean Soup is perfect for cool winter nights. 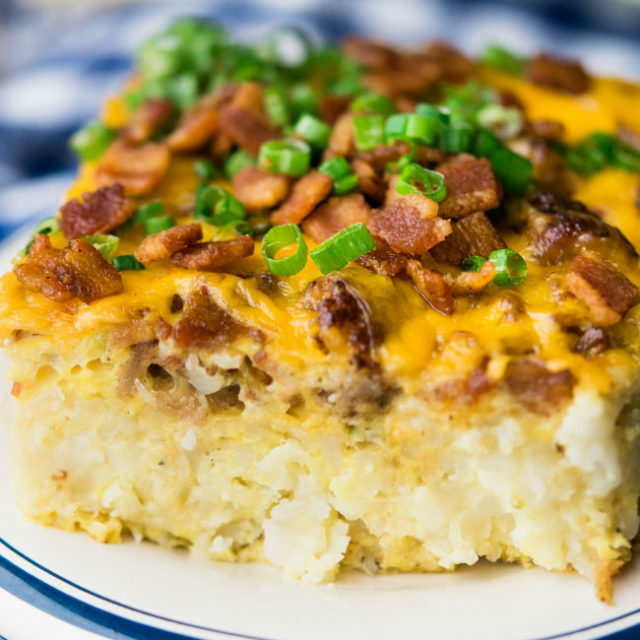 Warm, Thick and Hearty with a punch of smoky flavor in every bite! Chicken Taco Soup – brings all the best taco flavors into a family friendly, hearty, healthy soup! Stovetop, Slow-cooker, and Instant Pot versions included! Mexican Chicken Soup – brims with tender chicken, fresh vegetables, and southern spices. The unique cilantro, cheese, and chip topping seals the deal! Spinach Soup – is so rich and creamy- your family won’t mind eating their veggies! 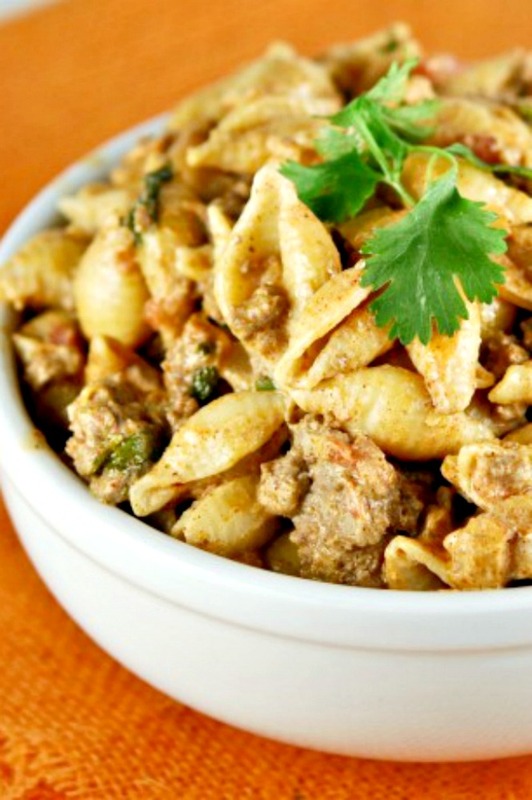 Quick to make & hearty enough for a meal, it looks pretty on the table too! Beef Noodle Soup – Introducing beef noodle soup: a complex broth teeming with chunks of browned beef and an array of chopped vegetables. A toothsome midweek pick me up! Hi, Mary. The broth should be added with the rest of the ingredients after adding the red wine to the beef. Thank you! I always make a slightly different of this soup. First, I brown the meat in the same large soup pot,remove the meat and then add the ground onion, celery and ground garlic with a little vegetable oil, stirring constantly. I deglaze and reintroduce the meat and add some soup bones. Then I add the potatoes, carrots and TURNIPS into the pot along with ground parsley and basil from my garden, along with about two teaspoons of salt and black ground pepper. I then fill the pot with water and about three cans of concentrated tomato soup until it covers the veggies, and cook about three hours at a high simmer. I let it cool somewhat and put it into the fridge overnight. Then next day, I simmer it again for another three hours, and, man, it is delicious. I really think the turnips do the trick. They add such a delicious flavor! I halved this as I only had 1 flank steak. I pretty much followed it fairly closely, with only 5 large mushrooms, added a half a chopped turnip, and only 2 small potatoes. Was worried the beef wouldn’t become tender but it was good enough after an hour or more. I used Better than bouillion and just water. It all had good flavor and my husband liked it a lot, and he doesn’t care for real tomatoey things so it’s not all that tomatoey. Thanks for the recipe! I am glad you gave the recipe a try and that your changes worked out for you. Thank you for sharing your experience with this recipe, happy you enjoyed it! I made this and although I love Tomatoes they seem to over power the taste of the broth. There is one thing that is confusing to me in the recipe that I feel needs clarification. It says to use 48 ounces of Beef Broth and then it states to use 1 1/2 Tbs of Better than Bullion. I made my 48 ounces of Beef Bullion mixing Better than Bullion with water and then adding the 1 1/2 TBS of additional Better than Bullion but the Tomatoes still over powered the the flavor (which I’m ok with since I love tomatoes) but I’d prefer to have a beefer taste to the stock. Hey Joe. Thanks so much for sharing your experience with this recipe. About the tomatoes, gosh, I think they add an essential flavor foundation of vegetable flavor to the broth. I guess we all have different preferences 🙂 It’s really great, though, for me to hear others feel about the recipe! I made this for a snow day go to. It is very good but I would omit to wine and deglaze with stock instead. The wine flavor seemed to over power the simple soup taste and made it taste more like stew.